Our timber stables for sale come in various shapes & sizes. Our wooden stables are constructed of 175×22 planed pressure treated maintenance free timber on a sturdy timber structure. The interior of the stable is lined with Sterlingboard / OSB board to roof height. The roof uses a galvanised steel box profile in a dark green colour with guttering fitted to the front of the stables. 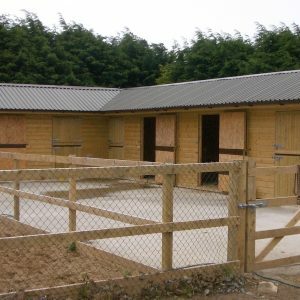 Additional stables, tack rooms and feed storage units can easily be incorporated within the basic design. For more information, simply get in touch with one of our team. The price of additional units and non-standard sizes can be obtained by sending us details of your requirements. The price for supply and fit applies to the Leinster area and excludes V.A.T. @13.5%. For the additional cost of supply and fit to other areas please phone our office. Should you have any queries or require further information please do not hesitate to contact our office.